A new Salem attraction devoted to one of the state's most enduring murder mysteries is itself the subject of controversy, including a federal lawsuit. The True Story of Lizzie Borden features exhibits about the celebrated 1892 case in which Borden was accused of killing her father and stepmother with a hatchet in their Fall River home. A jury acquitted Borden. Even before The True Story of Lizzie Borden opened its doors on the Essex Street pedestrian mall last month, the Lizzie Borden Bed & Breakfast in Fall River filed suit in US District Court, contending that the Salem attraction was infringing on its federal trademark, Lizzie Borden Museum. Officials of The True Story of Lizzie Borden deny the charge. Others in Fall River are unhappy about a Salem business focused on what they consider a Fall River story. "It almost seems opportunistic that a city like Salem, with such a large and diverse series of attractions and museums, would actually do something like this," said Peter Kortright, president and chief executive of the Fall River Area Chamber of Commerce. "What if Fall River or New Bedford decides to open a witch museum or build a House of Seven Gables? It sort of muddies the water." Kortright said he hopes the opening of the Salem attraction serves as a wake-up call for his city to do more to bolster its cultural economy. But Leonard Pickel, manager and part owner of The True Story of Lizzie Borden, said he was simply acting on a business opportunity. "Salem brings in 600,000-some odd people a year . . . to learn about the witchcraft hysteria in Salem," he said. "Lizzie Borden is Massachusetts history and we are 15 minutes north of Boston. Fall River is 50 minutes south of Boston. So it seemed like a no-brainer to us for a long time." Referring to Fall River, he said, "I can understand their feeling that they own Lizzie Borden, but . . . it belongs to Massachusetts as much as Fall River." He added that his attraction could even help Fall River by prominently mentioning the city in its exhibits. Located in Borden's former Fall River home where the murder took place, the Lizzie Borden Bed & Breakfast offers lodging, tours, and a gift shop, according to its website. The business obtained a trademark for Lizzie Borden Museum in 2002, according to the lawsuit. The suit alleges that the Salem business infringed on that trademark through its use of the names The True Story of Lizzie Borden Gift Shop and Museum and The True Story of Lizzie Borden, and its use of Lizzie Borden Museum in its website domain and e-mail. Someone answering the phone at the Lizzie Borden Bed & Breakfast said the business would have no comment. Jeremy Blackowicz, attorney for the bed and breakfast, said, "We do not comment on pending litigation." A federal judge on Aug. 22 granted The True Story of Lizzie Borden an extension until Sept. 10 to respond to the lawsuit and a preliminary injunction sought by the Fall River bed and breakfast. A hearing is set for Sept. 25. Pickel said, "We wouldn't have opened the business if we felt it was in violation of their trademark." He said his business had used the words gift shop and museum for descriptive reasons, and has voluntarily dropped them from its materials. Pickel said he has no plans to drop the Web domain, which he said was registered in 2001 - prior to the bed and breakfast receiving its trademark - and no plans to change the e-mail address. 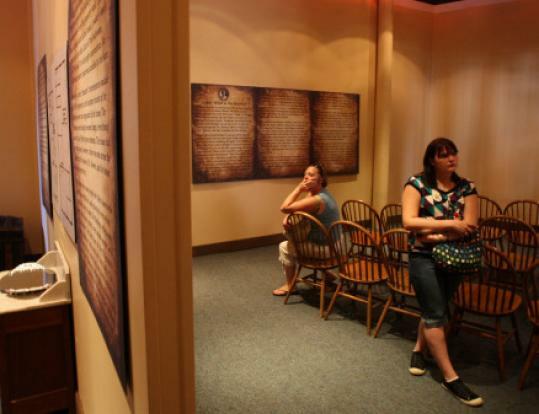 It boasts no original artifacts, but Pickel said the Salem site offers period antiques; text; enlarged, reproduced photographs; artifact reproductions; and a mock-up of the courtroom where Borden was tried. "The reason we call it The True Story of Lizzie Borden is not because it's the only place you can learn about Lizzie Borden, but it's a place you can cut through all the rumor and myths you've heard . . . to get to the truth of the story," he said. Salem Chamber of Commerce director Rinus Oosthoek said that a Lizzie Borden attraction is "not something I think that anybody else in this area would come up with as an idea to start in Salem." But "it's a choice of the entrepreneur to do what he thinks best for his business. This owner thought Salem would make a good choice," he said. Fall River Mayor Robert Correia said he would prefer that the new Lizzie Borden attraction be located in his city. But he said if the location of a Lizzie Borden attraction in Salem "would add any economic benefit to our city, we would want to take advantage of it." The Fall River Historical Society has the largest collection of Borden trial exhibits and is the largest repository of material on the case and Borden's life, according to its curator, Michael Martins. He said his board at its meeting Sept. 10 will discuss a request by the Salem attraction for copies of some of its materials. Pickel, meanwhile, said he sees a bright side to the controversy. "Love me or hate me, it's gotten Lizzie Borden on the front page," he said.